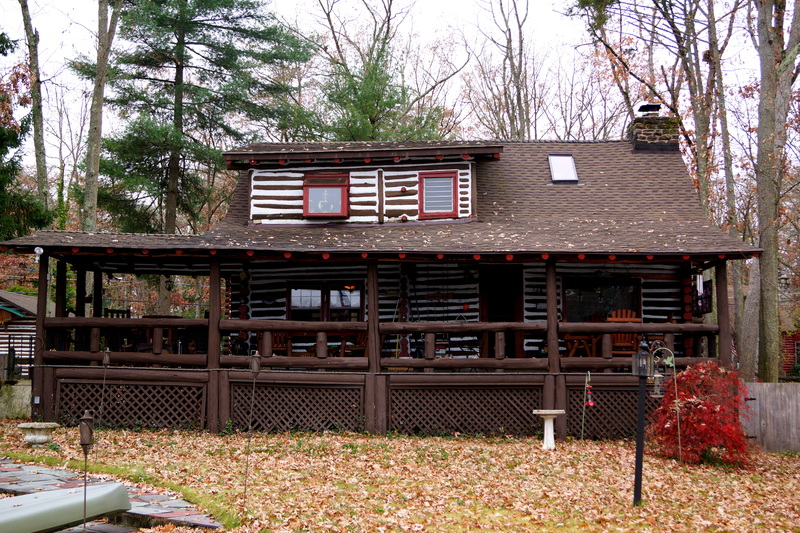 The home we purchased was a real cedar log log home, built in 1927. It is built on a double lot, with a 2-car log constructed garage. Some time over the years, the original logs AND ceilings of the entire home were covered over by painted-white paneling. The original hardwood floors were covered with rug…It was infested with mice, flying squirrels (yes FLYING) – and bats (YIKES)…(all of which we finally were able to safely remove and relocate). The cabin also had an entire log wall whittled down to toothpicks by the family of (regular) squirrels living between the paneling and logs (family of squirrels also safely relocated!). …Aaaah…with the adventures we encountered…I could have written a book! Our goal: Restore it back to it’s original glory…expose all the logs, fix all the chinking (white stuff in between the logs), and make some upgrades along the way – all “DIY” style…ON OUR OWN! … My thought at the time was “No problem!” … I swore we’d be done the home in it’s entirety in 3 years… what I quickly came to realize is that we had just purchased a life-long project! Although frustrating at times, it has truly been one of the most rewarding things Brian and I have ever done. The memories we have created here, both inside the home, and out on the lake, are priceless! Posts to follow are just SOME of the things we have demolished, built, and restored! This entry was posted in Cabin and tagged cabin, Cello, gsp, log, restoration. Bookmark the permalink.